If your site’s internal linking structure resembles a lump of tangled wires, and it takes you 10 clicks to navigate to a blog post that you published just a week ago — you are doing it wrong. Poor internal linking doesn’t just have a negative impact on user experience; it hinders ranking growth. Luckily, internal linking is one of the SEO factors that are 100% under your control. And in most cases, you don’t need any technical skills to fix it. Follow along with this practical guide, find out more about internal linking best practices, and learn how to implement 6 proven internal linking strategies. Menus and navigational elements, like header, footer, tag cloud, and breadcrumbs mostly consist of internal links. Such internal links help form the hierarchical structure of a website. Typically, navigational links channel users from the home page through the category pages to landing pages and back. Similar to many SEO factors, internal linking has a double effect on your website. On the one hand, it influences user engagement metrics, including time spent on website, page views per session, and conversion rate. 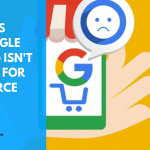 On the other hand, it’s a significant ranking factor that can boost your positions in the SERPs and bring additional organic traffic for free. 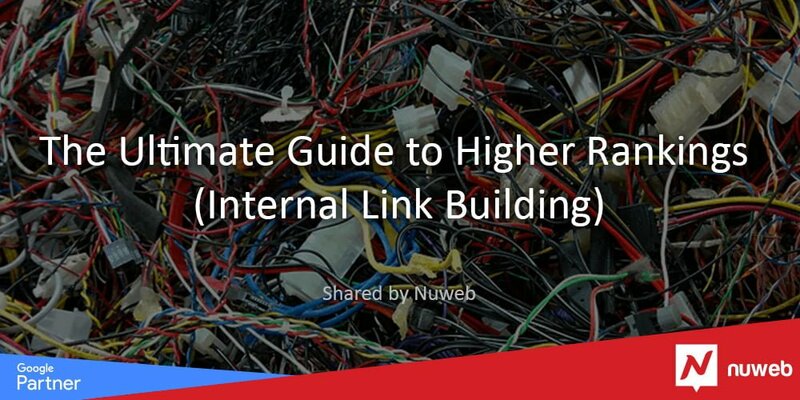 Before we get down to the internal linking strategies to help you boost rankings, let’s make sure you’ve got the basics right. Here are the 8 things that must be present in your site’s internal linking structure. 1. 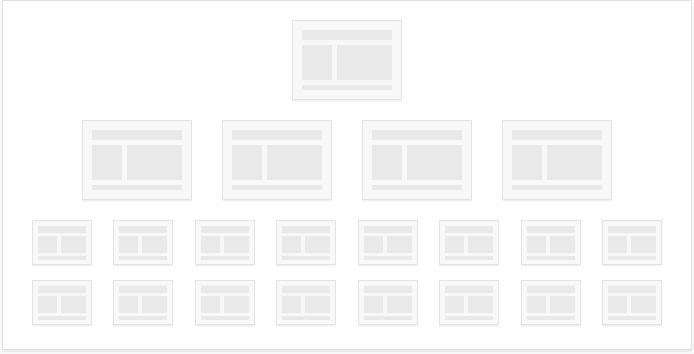 Keep a shallow website structure. It is considered a good practice when each page can be reached within 2-3 clicks from the homepage. Nowadays, users are very demanding when it comes to the speed of websites, including page load time and the time required to complete certain actions. They expect to complete their goals fast. Why should one bother to get through tens of unnecessary links if there is plenty of similar websites out there that let them complete the same goal faster? It’s boring and frustrating to perform redundant actions. Thus, it is crucial to reduce the number of clicks it takes to get to important landing pages. 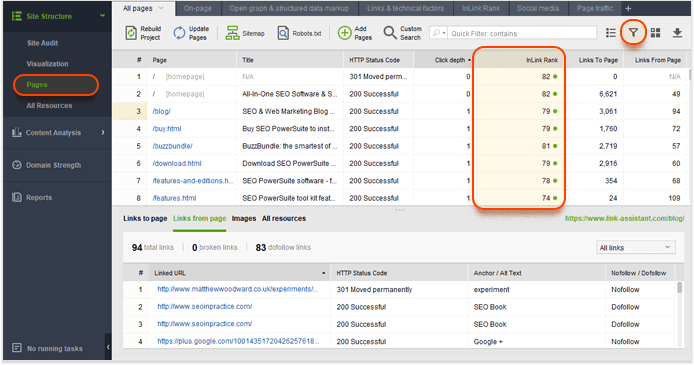 To check your pages’ click depth, fire up WebSite Auditor. The tool will show you how many link clicks it takes to reach any given URL. All you need to do is create a project for your site (or open an existing one) and jump to Site structure > Pages. Then sort the URLs by Click depth by clicking on the header of the column. 2. Make sure all the important pages are linked. These days, search engines rely both on sitemaps and links to discover web pages. It means that even unlinked — or the so-called ‘orphan’ — pages can be found by the search engines as these pages are listed in the sitemap. But it’s impossible to find ‘orphan’ pages through the website’s navigation. Such pages virtually don’t exist for the users. It’s a good idea to get rid of orphan pages; you can either delete them (if they are useless) or link them from other pages of the website. Landing pages that are created for pay-per-click campaigns are an exception. They often act as independent website areas that are not linked from main website’s content and are normally blocked from indexation. You can use WebSite Auditor to find orphan pages on your website. You’ll need to rebuild your WebSite Auditor project. To do this, go to the Pages dashboard and click Rebuild Project. Once the crawl is complete, you’ll be able to find orphan pages in the Pages dashboard, marked with the Orphan page tag. A good website structure typically means that all of the site’s important pages are linked, and it takes up to 3 clicks to reach the deepest website level. 3. Keep the number of links per page reasonable. Thus, if you want to send more ‘ranking power’ to pages you link to, reduce the number of outgoing links. 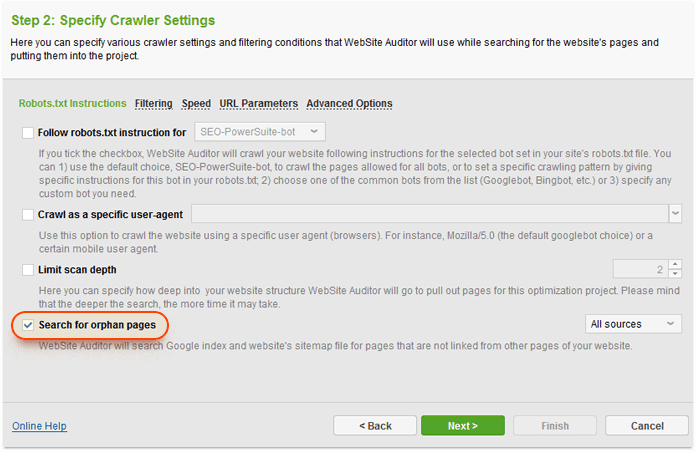 WebSite Auditor will help you detect all pages on your website that have over 100 links, both internal and external. 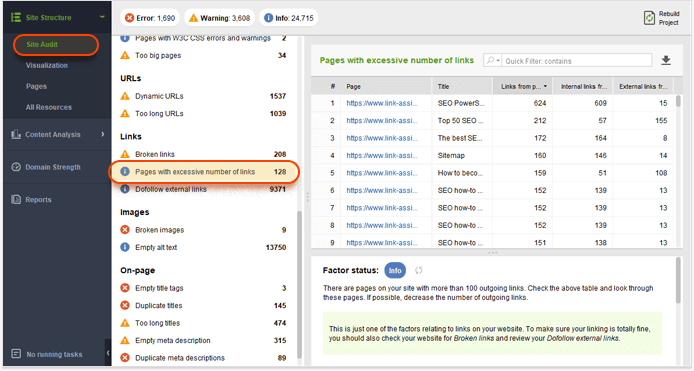 To get a list of pages with too many links, go to the Site Audit dashboard in your WebSite Auditor project and click on Pages with excessive number of links. 4. Use keywords in the anchor text. Using keywords in the links’ anchor text is yet another measure you can implement to improve keyword rankings. In a sense, internal links act like backlinks, so using relevant terms in their anchors is a free and simple way to boost topical relevance. It’s worth noting that in the post-Penguin world, most SEOs wouldn’t advocate the use of exact match keywords in internal links’ anchor text. 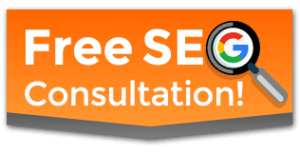 You would often hear SEOs say, “use natural anchors or you’ll get penalized”. Personally, I’ve never heard of a website getting penalized for the anchors of its internal links though. And if you want my opinion, I believe that the anchor text should be descriptive of the linked content. Matt Cutts agrees. You can also do it the other way around: switch to Links to page to see all internal links to the page you’re examining along with the anchor text. 5. Make sure image links have alt attributes. The alt attribute of image links acts like anchor text for text links — so it’s another opportunity to send a ranking signal to search engines. 6. Mind duplicate links to the same URL. If there are several links on the same page that point to the same URL, search engines would give the priority to the first anchor text. Keep this in mind and use the right keywords in the first link’s anchor: subsequent anchors won’t matter as much. 7. Place links within pages’ main content. The links placed within page’s content have a higher SEO value than the ones in the header, footer, or sidebar. The latter have more to do with navigation, and it looks like Google treats those as non-editorial links. Link in the main content, on the other hand, add new information and value to the text. Furthermore, the text and keywords surrounding a link also matter for the ranking of the target page. For additional info, see this guide to how link placement influences its SEO value. 8. Open non-navigational links in a new tab. On the contrary, if you force links with additional information to open in a new tab, it’s easier to go back to the original piece of content. Here are the 6 strategies you can use to improve your internal linking. Out of the numerous strategies out there, I’ve seen these 6 have the biggest effect on SEO and rankings. You can pick just one of them for your site, or use several in combination for even better results. 1. Point links from traffic pages to conversion pages. Many companies run a blog to create “engaging and useful content”. Some of them achieve the goal, and their posts attract significant traffic. The problem is that a blog post can rarely boast a high conversion rate. Why not channel users from high-traffic blog posts to landing pages that are specifically optimized for conversion? 1) Find landing pages with high traffic and a comparatively low conversion rate. To achieve this goal, open the Google Analytics. Navigate to Behavior > Landing Pages. Sort the URLs by the number of sessions. Hit the Comparison icon and choose the relevant metric from the drop-down menu (e.g., the overall conversion rate). You can further filter the URLs to meet certain criteria, such as show only blog URLs. Pick the URLs that enjoy high traffic but have a low conversion rate. 2) Identify pages with a high conversion rate — your top converting landing pages. Use a similar approach to the one described in the previous step. 3) Use links to the high-conversion pages on the high-traffic pages. Image links or banners are likely to attract more clicks than text links. You can further experiment with link placement or banner variations within the page. 2. Point high-PageRank pages to low-hanging-fruit pages. Let’s assume you have a blog with tons of useful content. And as we all know, useful content attracts external backlinks. We can use the accumulated link juice your blog posts enjoy to promote pages that are stuck somewhere on page 2 in the SERPs. These are the so-called low-hanging fruit pages. To estimate link juice or PageRank, SEO PowerSuite’s InLink Rank is a huge help. It’s based off the same formula as Google’s original PageRank, and it does the same thing — evaluates the ranking power of a page based on the quality and quality of its backlinks. 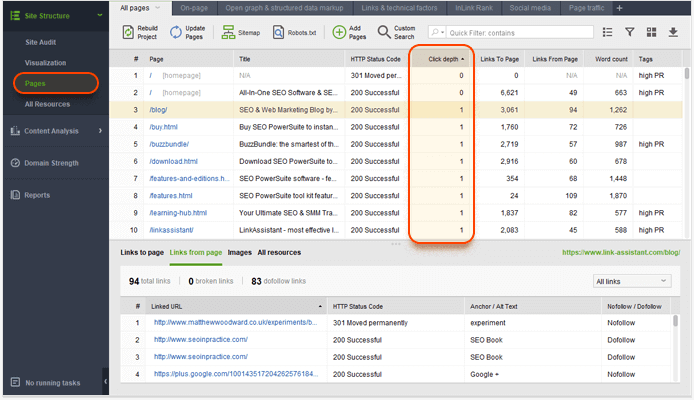 1) Find pages with high InLink Rank. In Website Auditor, open your project and go to Site Structure > Pages. Click on the header of the InLink Rank column to sort the URLs by their InLink Rank. If you don’t have an InLink Rank column in your workspace, right-click the header of any column to add it. You can also apply a custom filter to find pages that meet certain criteria, e.g., the blog pages. Use the filter icon to do that. 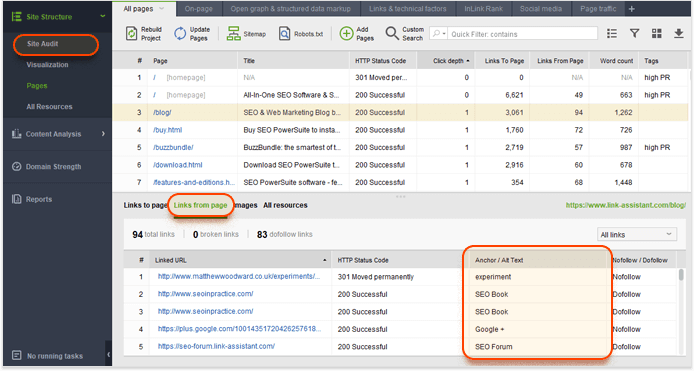 2) Find pages that rank at the top of page 2 for your target keywords. We are going to use Rank Tracker for this task. I’ll assume you already track rankings in Rank Tracker (otherwise, you’ll need to import your target keywords into the tool and run a ranking check for them). This will show you the keywords for which you rank on the top of page 2 (of course, you can select a different range that fits your needs). Sort the results by Google Rank and discover the URLs that you’ll link to from your high-PageRank pages. Don’t forget about the keywords — you’ll use them in the links’ anchors. 3) Add links to the pages you chose at Step 1. Mind that it’s vital that the newly added links are relevant to the content of the source page. That’s it! Sit back and watch your keywords crawl to the top 10. 3. Use internal linking to help your main pages rank for high-search-volume keywords. NOTE: This and the following two internal linking strategies are based on the competition level and search volume of your keywords. The implementation workflow is very similar. That’s why I am going to describe it only once. In this scenario, your website is optimized for a few high-search-volume, high-competition keywords. Such keywords often have very generic meaning, e.g., “buy cheap shoes”. Typically, you’ll have the content of the homepage optimized to rank high for these keywords, with other pages serving an auxiliary purpose. These pages still provide useful information to users, but they are not supposed to rank high for any keywords. Clearly, you’ve got navigational links that let users move around your website. But the majority of contextual links point to the homepage. The anchor text of these links should include target keywords. It is important to use anchors consistently, i.e., use only variations and close synonyms of your target keywords. In such internal linking structure, the homepage has a lot more links pointing to it than any category or bottom level pages. In WebSite Auditor’s lower screen, click on Links to page. Here, you can tell how many internal links each URL has. At a glance, you can tell if the homepage has the right amount of internal links pointing to it. 4. 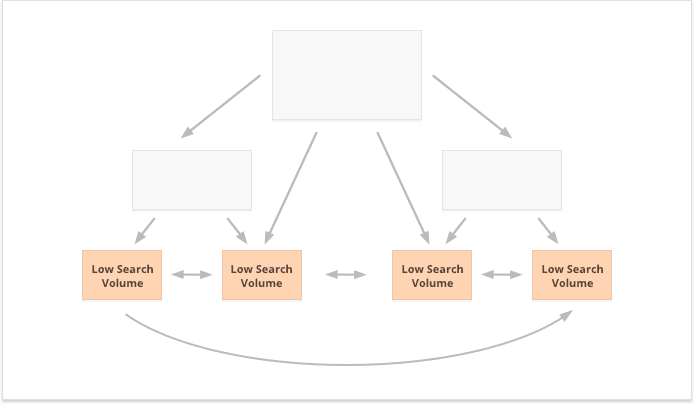 Create an internal linking structure targeted at mid-search-volume keywords. 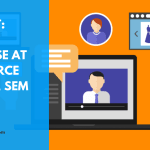 In this scenario, you are primarily focused on mid-search-volume keywords. Typically, these are three-word keywords with a more specific meaning than terms discussed in the previous point, e.g., “buy Gucci shoes” or “best Gucci shoes”. They often belong to a product category within e-commerce websites or to subject categories in blog-like websites. 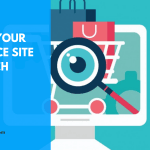 It means that in this approach, category pages have the highest priority; that’s why they should get the most contextual internal links pointing to them. Remember to use anchor texts consistently. Also, make sure that category pages are no more than one click away from the homepage. 5. 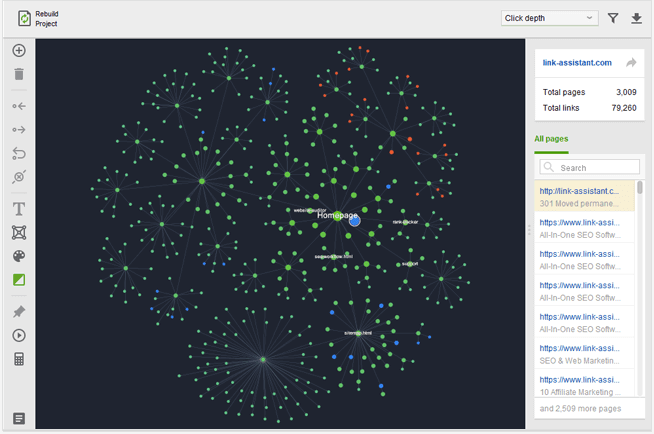 Target low-search-volume keywords with internal links. This strategy implies that you don’t care about the number of internal links, their anchors, or any SEO tricks. You just follow common sense and create links to the content that may be helpful to your users; as simple and elegant as that. In practice, it means that you should only keep in mind the internal linking best practices that I mentioned in the previous section of this guide. To sum it up, you learnt what internal links are and why it’s important to have a solid internal linking structure. You got through internal linking must-haves that should be used universally by any webmaster. 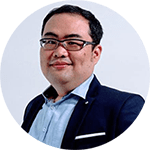 And finally, you read about 6 internal linking strategies that can have a major impact on your rankings if you implement them right. I’m sure there are more tricks and strategies out there. If you have any suggestions or ideas to share, please let me — and fellow SEOs — know in the comments below!